U.S. Customs and Border Protection (CBP) stopped stamping I-20 at port of entry. My port was Atlanta and my I20 isn’t stamped. I confirmed it with the International Services office and they say it isn’t.a problem. Read more about CBP Not Stamping I-20. Students are facing problems at SSN, Drivers license office, since I-20 is not stamped and officers at SSN and DL office are not used to seeing I20 without stamp. CBP have issued the following update regarding this situation for students. As of Aug. 10, 2012, U.S. Customs and Border Protection (CBP) no longer provides admission stamps on Forms I-20/DS-2019 for prospective and returning international students and scholars (traveling with F, M, and J visas) seeking admission to the United States. 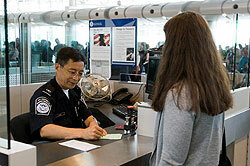 This change makes CBP processes consistent with U.S. Citizenship and Immigration Service’s (USCIS) recent change to stop stamping Forms I-20/DS-2019. Although placing an admission stamp on Forms I-20/DS-2019 has been a longstanding practice at CBP, it is not required. While the admission stamps on Forms I-20/DS-2019 are not indicators of lawful status or academic program duration, some state and federal benefit granting agencies have required international students and scholars to present stamped versions. State requirements vary. Share this page to your friends who came for Fall 2012 semester. This change will directly impact several students. another way to waste time and resources instead of just issuing a single stamp that takes than a minute. wonder why this country immigration system is broken, just another reason.